I know that I have mentioned this before, that iPod/iPhone/iPad docks are dime a dozen – but just how loud can such devices get? If you are renting an apartment and want to irritate the rest of your owner’s neighbors, or just want to make a plain nuisance of yourself, then you would do well to consider the iNuke Boom from Behringer. The name of this particular iDevice dock is rather obvious, it will deliver audio levels and quality that, in street parlance, “is the bomb.” The big question is this, just how much more explosive can it get? The name Behringer might give you a clue, being an award-winning innovator of affordable professional audio and music equipment. 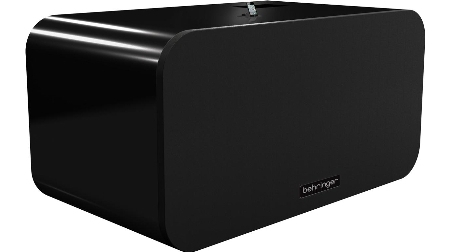 In order to celebrate the launch of 50 new consumer audio products, Behringer’s iNuke Boom is proud to be the loudest iPad, iPod and iPhone dock that anyone and everyone would have ever come across at CES next year in Las Vegas – which incidentally, is only a month away. As with anything and everything in life, there is a price to pay, and this particular one will actually make your banker cry to the tune of $29,999.99. I guess it also makes perfect sense, considering you would need to pay such a behemoth of a price tag for monster sound, not to mention the fact that this puppy is really, really huge, as it measures 8 feet wide and 4 feet in height, tipping the scales at more than 700 pounds (try tipping that over! ), pumping out more than 10,000 Watts of power. There will be a quartet of distinct product lines that will be marketed under the EUROSOUND name, where the Home line delivers a professional, live concert sound from the stage into the comfort of your home, EUROSOUND Live products will have their work cut out for them to amplify your sound, EUROSOUND Portable products deliver a mobile audio experience that is anytime, anywhere, and last but not least, the Creation line lets you show the world that you need not be a professional musician in order to churn out great music. Value for money would be the commitment here, although I am not sure who would drop such an amount of serious coin for the iNuke Boom.